This has been my lunch for the past 6 months, no joke. When I find something I love I make it every day, ad infinitum! It is so good, warm, flavorful, and healthy! Quinoa is a superfood that, although it is very grain-like, is akin to the spinach family and is super high in protein. This is my favorite way to enjoy this awesome grain. 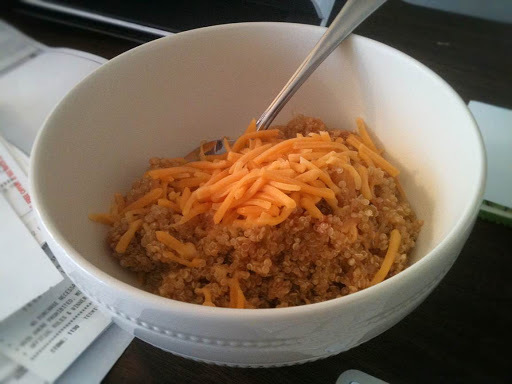 I bought quinoa on sale at Amazon (see, I buy everything on Amazon!). The current price of $23 (*it’s on sale now!) is more than I paid, but I love the bulk of this package – I feel like I will never run out and can eat it forever. Well, maybe only if you are me. I make this and store it in the fridge. It is perfect to heat up for lunches. Every day. Enjoy! Bring quinoa and water to a boil and then simmer until cooked. This usually takes about 15 minutes. While it is simmering, add the salsa and black beans. When done, scoop into a bowl and top with cheese and avocado. This is also good over spinach or romaine for a nice salad topper. I hope you find many ways to enjoy it!